Blazing Saddles is rude, crude, and politically incorrect. It also happens to be one of the funniest movies ever made. So what’s the difference between this and the sort of racist jokes that idiots lament not being able to tell for fear of offending someone? Excellent satire, that’s what. The brilliance of Saddles is that it takes a well trod genre, the American Western, and exposes the racism that permeated these early movies (and the historical “Wild West” itself). Chinese and black workers are accused of “lying down on the job” for ridiculous reasons, such as getting knocked out with a shovel or crawling out of quicksand. Their lives are deemed less valuable than a railway handcar. Racial slurs are regularly hurled at them by slack jawed yokels. Mel Brooks briefly portrays a “Hollywood Indian” with a twist– he speaks Yiddish. This is not subtle satire, for sure, but it gets the point across while also being wickedly funny. This film is also full of great actors delivering hysterical performances. Cleavon Little stars as Bart, a black man who is chosen to be the new town sheriff in a bid to get the entire population to abandon their homes. He is charming and handsome, and really sells the ridiculousness of an entire town hating him just because he happens to be black. Bart befriends Jim, or “The Waco Kid,” played by the always lovely Gene Wilder. (I once went to a book signing of Wilder’s. He is an adorable, quiet old man.) Wilder is a gem, and his performance here makes me lament the fact that Young Frankenstein is possibly years away on our viewing schedule. Harvey Korman is baddie Hedley Lamarr, Madeline Khan is German performer Lili von Shtupp, and Mel Brooks rounds out the cast as the idiotic Governor William J. Le Petomane. Skewering an entire genre aside, Blazing Saddles is full of wacky visual gags, hilarious one-liners, and an abundance of anachronisms. This level of clever insanity is rarely seen in comedies today, but it’s what Mel Brooks does best. I defy anyone to watch this and not crack up every five seconds. First of all, let me say that this movie would never get made today. It would be far too controversial and politically incorrect to even consider going into production. I’m glad this film was made though, as it is hilarious. 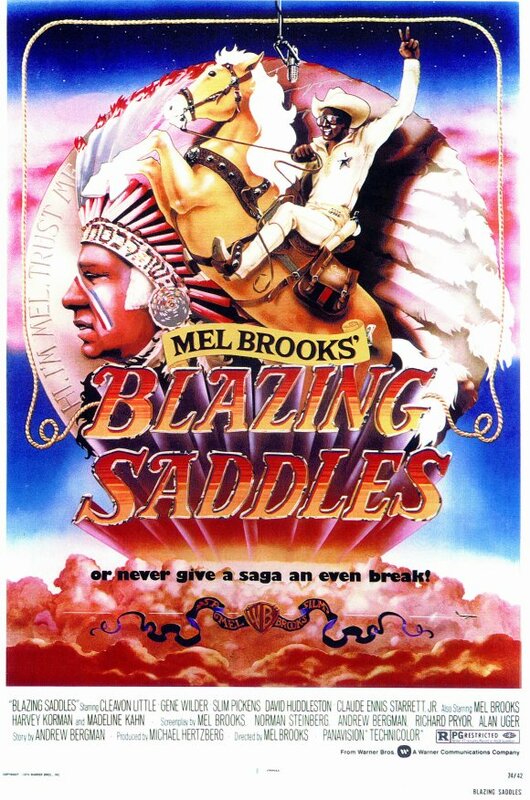 This is classic Mel Brooks, it is right up there with his other classics like Young Frankenstein, The Producers, or my personal favourite, Spaceballs. I had never seen this all the way through before last night, but it is still a very funny movie. A lot of the time, classic comedies from the 70s and 80s struggle to hold up when watched decades later, but Blazing Saddles is still sharp. It says a lot about Mel Brooks and co-writer Richard Pryor’s comedic ability that they can make films that are still funny no matter what era they are seen. Blazing Saddles is a western comedy, set in the town of Rock Ridge. There is a train track going through the middle of the town and the dastardly villain Hedley Lamarr (Harvey Korman) wants to buy the town’s land cheaply. In order to do this he devises a plan to run the townspeople out of Rock Ridge so that he can just take the land rather than have to purchase it. He starts by sending random thugs to cause trouble which prompts the townspeople to ask their Governor William J. Le Petomane (Mel Brooks) to appoint a new sheriff. Hedley persuades the Governor to appoint a dimwitted black man, Bart (Cleavon Little), as the new Sheriff. This outrages a very racist town, making it very likely Hedley will get his way. Bart, along with his constantly drunk sidekick, Jim ‘The Waco Kid’ (Gene Wilder), must convince the townspeople he is worthy of their trust and brave enough to be their protector. As you can probably tell, there are several racist themes in this film. The ‘N’ word is uttered freely and without consequence. There were so many times when I found myself thinking ‘they’d never do that today’. One such sequence involved Bart and another black companion being stuck in quick sand, and instead of rescuing the two men all of the white townspeople are more concerned with retrieving their expensive handcar. It is a very funny sequence, but I can definitely understand how many people would be offended by this movie. So the warning is out there, if you don’t like controversial and politically incorrect humour, then this film is likely not for you. I, on the other hand, love this type of humour and found myself in stitches throughout.